I started 2014 with good intentions - blogging at least once a week. As you have probably noticed, that fell to the wayside! The lack of post is certainly not because I have nothing to blog about! The quilting front continues to be productive. I've started and finishing a few projects. Okay, starting more than I've finished, but nonetheless, my quietness is not for lack of materiel to write about. 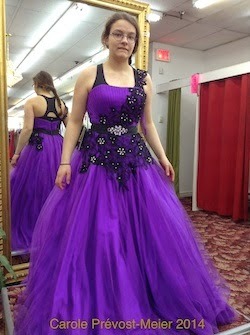 A couple of weeks ago, dd and I went shopping for a prom dress on St Hubert street in Montreal. That street is laden with history, it was the "street" to shop for the latest clothes and accessories during the 1950s - the fashion street. Today, it is more of a "formal wear street" (prom & wedding) than for anything else. Although I did see a shop that made custom bras and hats, something my mother would have bought as a working woman. I was surprised we didn't find anything. Many of the dresses were simple, nothing fancy about them ... all with an outrageous price tag! Oh well, perhaps I have not kept up with the times. This one was reasonably prices and I think looked wonderful .... but she found it to "puffy!" Afterwards we took a ride in the neighborhood of my youth! It was nostalgic! A wonderful mother and daughter bounding time! 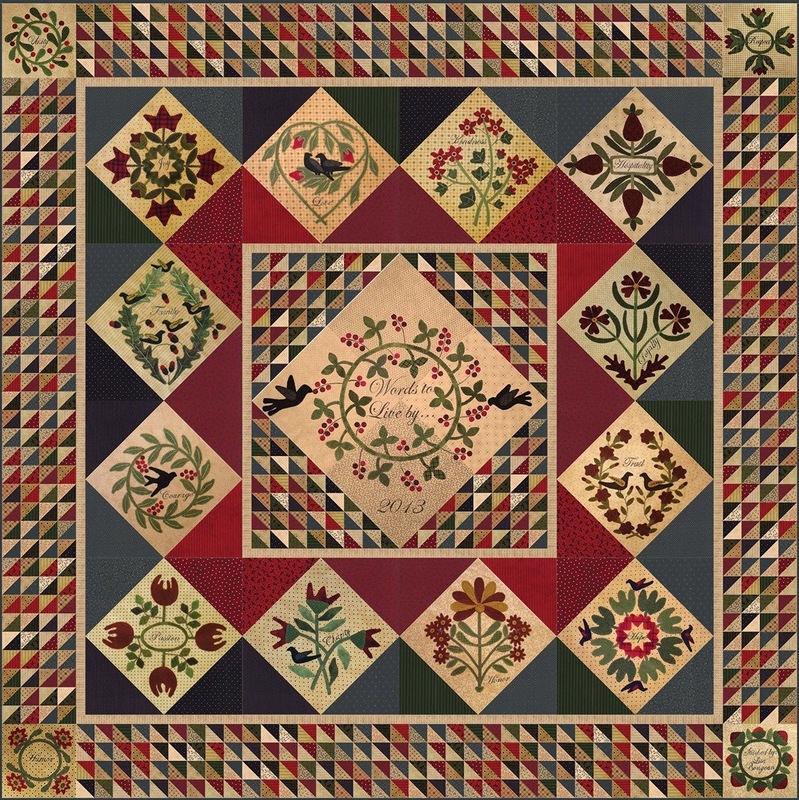 On the quilting front, I have started a new wool and cotton project - Words to Live By designed by Primitive Gatherings. Don't let the half square triangles intimidate you! It's a sinch using my "mass production" method. I have prepped all of my blocks and managed to finish stitching the center block. This way, I can alternate between sewing and stitching! Thank you for stopping by my little world in cyberspace! Cheers! A sure sign that spring is here! I don't know about you but for me, the sun shining sure has an affect on my mood! I feel so happy! Sunday was gorgeous, so I spent the day outside, enjoying some rays! What a great day! I felt so energized! I would like to share with you a recently completed project that is related to my last post on Sticky Fabri Solvy. Witches Hooray by Bird Brain Designs. I do love this quilt, being witches and all. However, let me talk a bit about the history of this project. This is the design that sort of sat around for a while, transitioning from spring to fall. In the summer, my needle would gum up a bit, just enough to be a nuisance. However, this was rectified by staying indoor and enjoying the a/c. As the product sat around exposed, it harden and became difficult to needle. On some places there are these small spaces between stitches. It was difficult for me to needle through the same hole. Hey, thanks for stopping by! Hope you are enjoying the change in seasons! Cheers!